discoveryeducation.com ■ Retail Price: $4000 per site per year. If the school system has Discovery Education Streaming or buys Streaming with STEM Connect, price is $3000 per site per year. Product Description: Discovery Education STEM Connect is a Web-based K–8 learning resource that helps teachers enhance their curricula and integrate STEM in to their classrooms. It uses the 4Cs framework to challenge students with real-world activities. Each unit integrates both online and hands-on critical thinking and problem-solving activities. Quality and Effectiveness: Discovery Education STEM Connect is an excellent resource for the classroom. It has a very intuitive interface that gives teachers a comprehensive and vetted set of materials that cover not only STEM topics but also cross over into math and literacy. Furthermore, these topics have real-world relevance, and therefore they give students insight into what they might want to pursue further in college or career. STEM Connect presents teachers with tools for building assignments, writing prompts, and interactive “boards.” They can save and combine resources to customize the learning and formative assessment process. Teachers can also monitor student understanding through student journals, graphic organizers, and constructed responses. Ease of Use: Districts that adopt STEM Connect will see it added to their new or existing accounts on the Discovery Education website in the “My DE Services” section. Its comprehensive support and training materials enable new users to get up and running quickly. Teachers can easily create, manage, and assign work to their classes. Finding resources is easy, since the material is broken down into units by topic/contents and grade level. STEM Connect uses the challenge, design, solve approach to each of its lessons. Interwoven with each category are subcategories that include “wonder, explore, impact, and test.” All of the lessons include teacher and student support materials that are available in a variety of formats—online, print, and multimedia. Creative Use of Technology: Discovery Education STEM Connect addresses schools’ ever-evolving curricular needs. Since it has rich digital content, it can be added to and refreshed as needed to ensure teachers and students have the most up-to-date content and tools. The flexibility of the platform allows teachers to differentiate instructional content easily and assess student learning efficiently. Students are given a set of tools that allow them to succeed regardless of their individual learning styles. Furthermore, STEM Connect’s “Global STEM Solution Seekers” feature connects users to a global community. According to their site, “In select units, students connect via GlobalLab, a global student laboratory, to share data and collaborate with others around the world.” These opportunities to collaborate on a global scale further enhance students’ college and career readiness. Suitability for Use in a School Environment: STEM Connect is an excellent product. Students are exposed to a variety of STEM topics and have opportunities to engage in hands-on projects in math and literacy and interactive virtual lessons. The content is clear, engaging, and well-presented, and it can be customized to differentiate as needed. Teachers are given complete flexibility in their lesson development, along with a set of tools to help them deliver the content. They can quickly select and assign content and assessments. 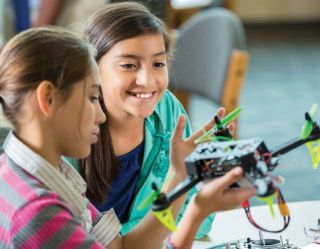 Discovery Education’s STEM Connect is an excellent solution. It strikes the right balance between content and activities to address all learning styles. The solution provides educators with the necessary tools to find and deliver high-quality content and build lessons quickly, which gives them more time to work with students. • High-quality, interactive content and materials engage today’s learners. • Flexibility allows teachers to differentiate and customize instruction. • Provides real-world connections to careers and further study in STEM-related fields.